Happy Thursday! 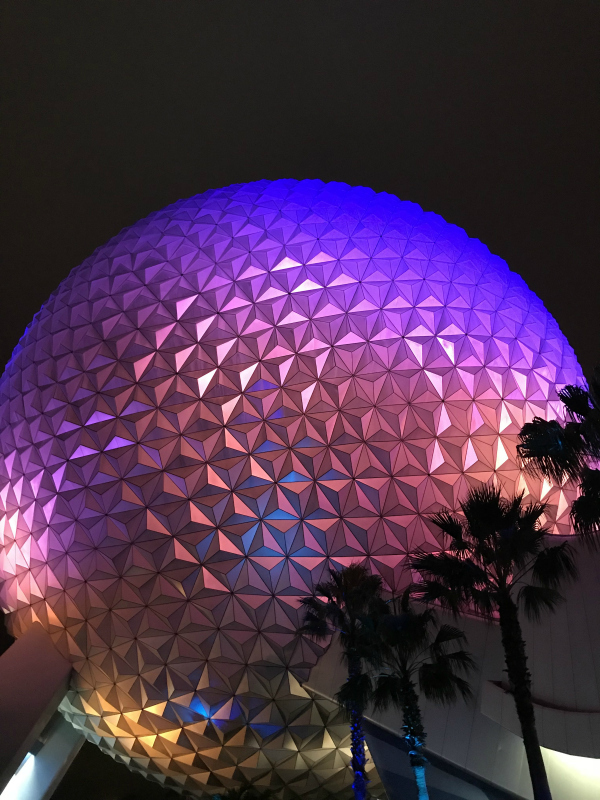 Last week I shared my Disney Style and earlier this week I shared about one of my favorite topics, Disney Food. 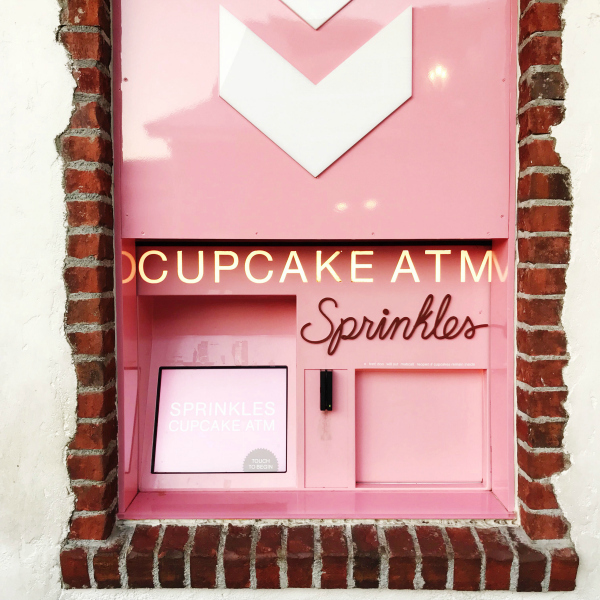 Definitely bookmark the food post if you have a trip to Walt Disney World coming up! 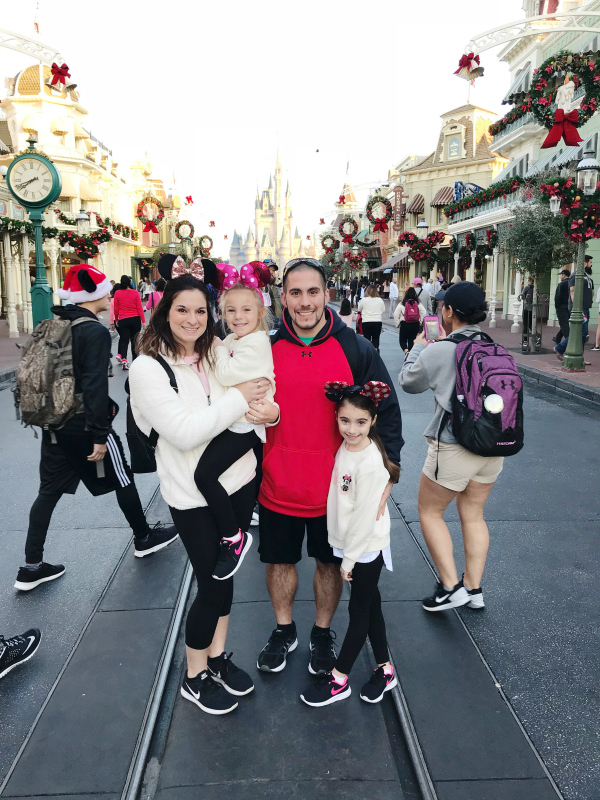 I've had so many questions about our trip so I thought I would put together a post to answer your questions and share some of my own personal tips. I am by no means a "Disney expert" but I do have some good advice to share that I hope can help out someone else. Some of these tips were shared with me by friends and it was great advice so I definitely want to share them with y'all. Feel free to ask any other questions by leaving a comment here on the blog or by sending me an e-mail. I am always happy to help if I can! Footwear I am sharing this advice straight out of personal experience. I wore my Millers on our first day in Magic Kingdom when we visited the first time. I wear them all the time and I never have any discomfort so I thought they would be great for walking at Disney. Um, no. They were fine for the first couple of hours but after three hours in, the bottoms of my feet were killing me! It was bearable but I wouldn't recommend them if you are planning on staying a full day like we did. Our second day of that trip, we were in Epcot so I wore my Converse shoes. Again, not a good idea because I wore them sock less like I normally do for a non-Disney day. They may have been okay with socks but it was terrible without socks. I got the worst blisters and could barely walk by the end of the day. Pick comfy footwear for Disney because you will be on your feet for 12+ hours. Even if it means wearing sneakers and socks. You will enjoy your days so much more when your feet don't hurt! I was so comfortable in my Nikes all week long! 1. Snacks. Disney allows you to bring in your own food. We filled our backpacks with crackers, nuts, protein bars, and other snacks. You can also save lots of money by packing snacks! 2. Phone Charger and Portable Charging Device. Disney drains my battery! 3. Pain reliever and band aids. I never leave home without these items, especially after becoming a mother. A band aid fixes everything when you are five, lol! 4. Ziploc bags. This might seem like a weird item to bring but I could have avoided a giant mess if I would have brought them! My youngest daughter's bottle of liquid medicine was in my backpack and it tipped over while we were at Epcot! If it would have been in a plastic bag, my leather wallet wouldn't have gotten ruined. 5. Swell Bottle. With all of the walking, you will need to stay hydrated. Especially if you visit Disney during the summertime! 6. Poncho. Buy ponchos in advance from the Dollar Tree because random rain showers are likely and you can also use these to stay dry on water rides like Splash Mountain. 7. Lip balm and lotion. You will want to be prepared with the must haves you typically keep in your purse. I always have to have lip balm with me at all times! FastPass+ We utilized our fast passes to the full extent! 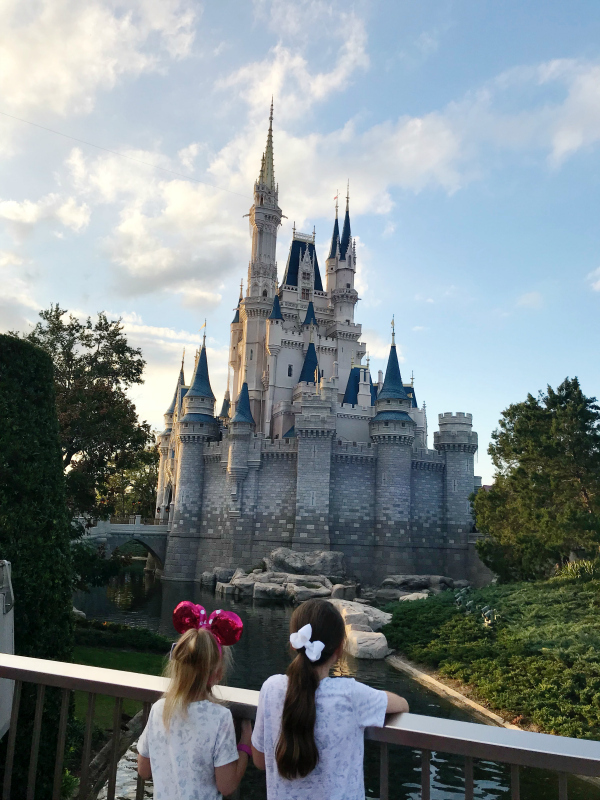 The longest we waited for anything during our entire trip was to ride the Seven Dwarfs Mine Train because it's my daughters' favorite ride in Magic Kingdom. Before you get to Disney, you will be able to choose three fast passes. If you are staying at a Walt Disney World Resort, you will be able to select your FastPass choices 60 days in advance! 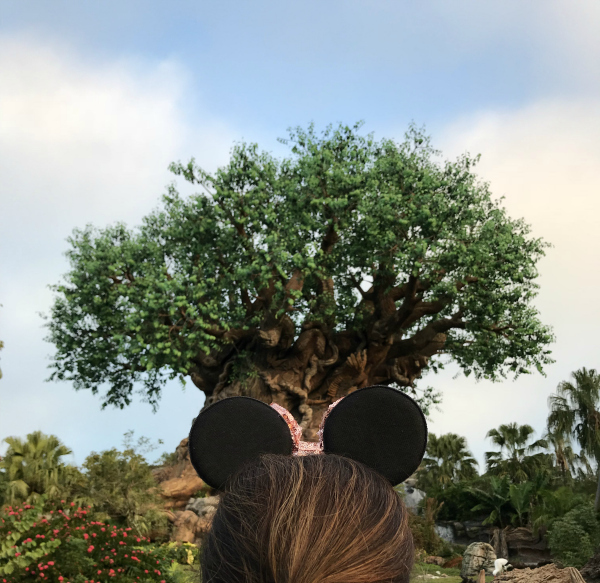 So 60 days before your trip, use the My Disney Experience app to choose your picks. Once you have used all three of the your advance picks, you will be able to choose another one at a time. You can pick another fast pass while you are waiting in line to get on the ride that you just used a FastPass for. I did that every time and always had another attraction ready to go to by the time we finished. There are FastPass kiosks in the parks but it's so much easier to do it straight from your phone instead of wondering around trying to find a kiosk. I would recommend choosing your first three picks for morning times before noon so that you will be able to choose another one right away. You will get to do so much more by doing this! Lodging Staying at Disney can be expensive but I would definitely recommend staying at a Disney resort. 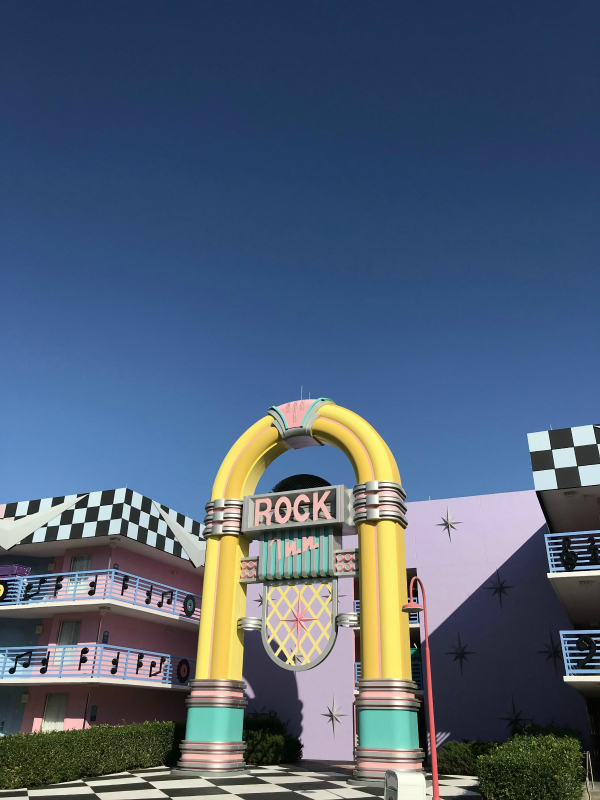 We stayed at the Pop Century Resort last time and this time we stayed at the All Star Music Resort. They are both two of the lesser expensive resorts but we personally don't need anything fancy for a family vacation. Especially at Disney because you are in the park all day anyway. Our room was super clean, the pool was amazing, the staff was very friendly, and we got fun messages from Mickey on our phone each evening if you let them know at check-in that you are celebrating something. You also get free transportation to the parks when you stay at a Disney resort so you don't have to worry about parking spaces or fees, which I personally think is awesome! Dining We chose not to invest in a dining plan because we want to eat all of the food and drink all of the drinks, lol! My kids also eat like birds so I kind of felt like it was a waste of money for us but I know other people who loved having the dining plan, especially if their kids were big eaters. We brought our own breakfast and snacks, and then just ate a light snack and our dinner at the park. Some of the best restaurants require reservations so you will need to reserve your first choices in advance. The only place I absolutely had to go was Be Our Guest. Don't give up if you can't find a time you want at the place you want to go. Keep checking, even on the day of! 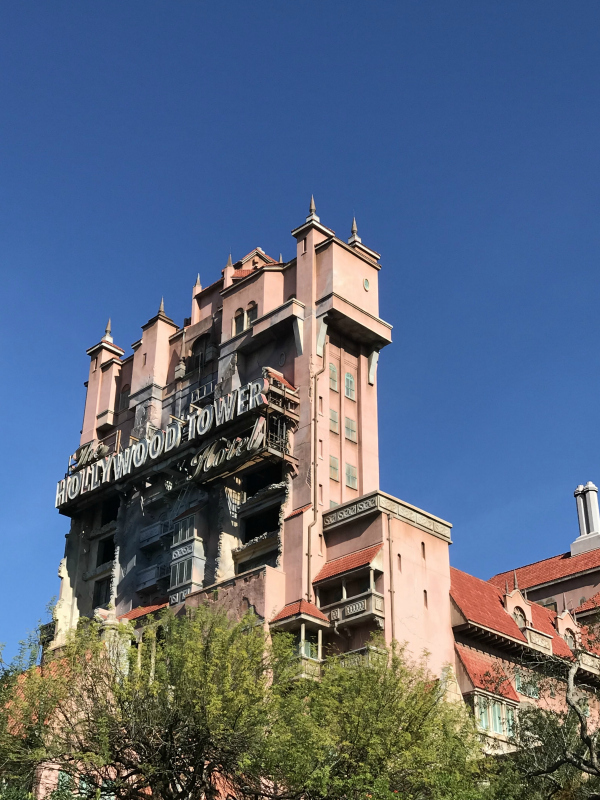 You can read more about our dining experiences in my Disney Food post. Prioritize You won't be able to do every single thing and this was hard for me! 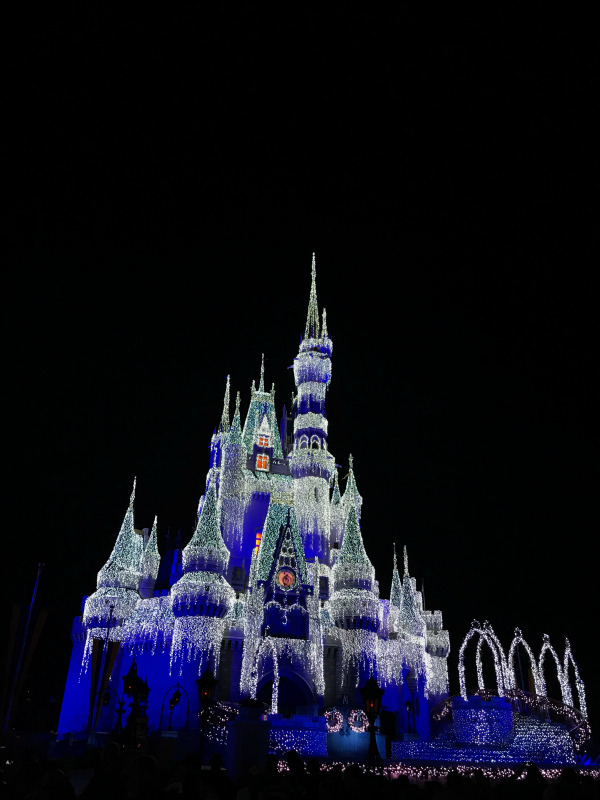 I really feel like you need three days to really see and do everything in the Magic Kingdom, especially if you have small children like I do. Before your trip, make a list of what you really want to see and do. Rank the list in order of importance and focus on those things. The things you really want to do the most, definitely get a FastPass for those if you can. 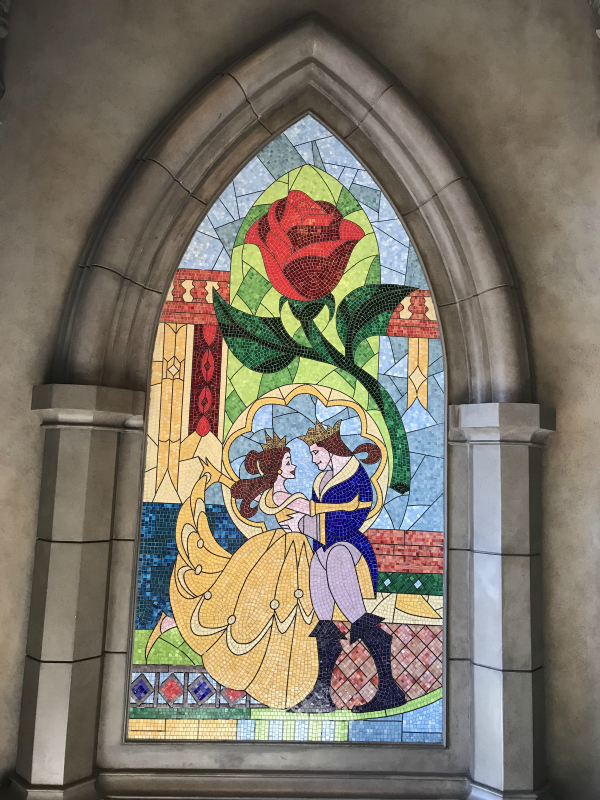 Enchanted Tales with Belle was my most important experience so it was our first activity of the day and it was definitely my favorite! Meeting the princesses was also high on our priority list because the girls are all about the Disney princesses right now. We were able to meet almost every single one of them during our trip without waiting in long lines! Also, we don't park hop. You can save a lot of money by not parking hopping but you will maximize your time if you stay in one park each day. Save Money My husband often calls me cheap (I prefer to be called thrifty) but when you are on vacation, that trait can definitely come in handy! In Florida, they often have an afternoon rain shower so go to the dollar store before your trip and buy at least one poncho for every person and take them with you to the park. 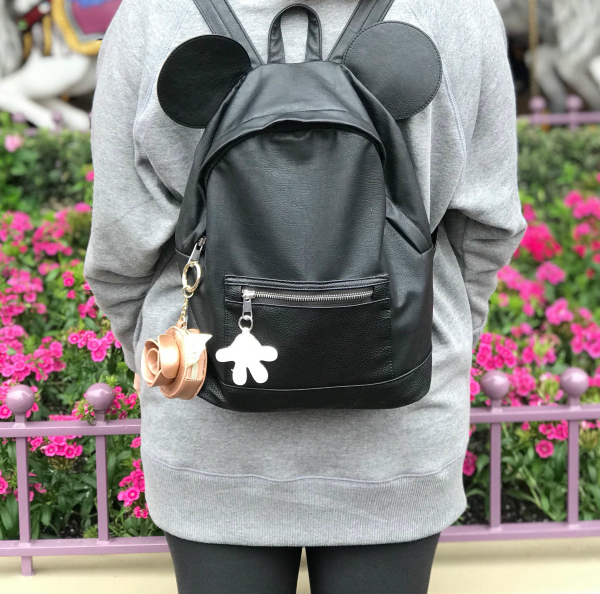 A poncho in the park is $10! Bring a good water bottle. My Swell bottle came in handy and was a must have for us! Bottled water is so expensive, at least $3 a bottle so fill your bottle with ice before you arrive. 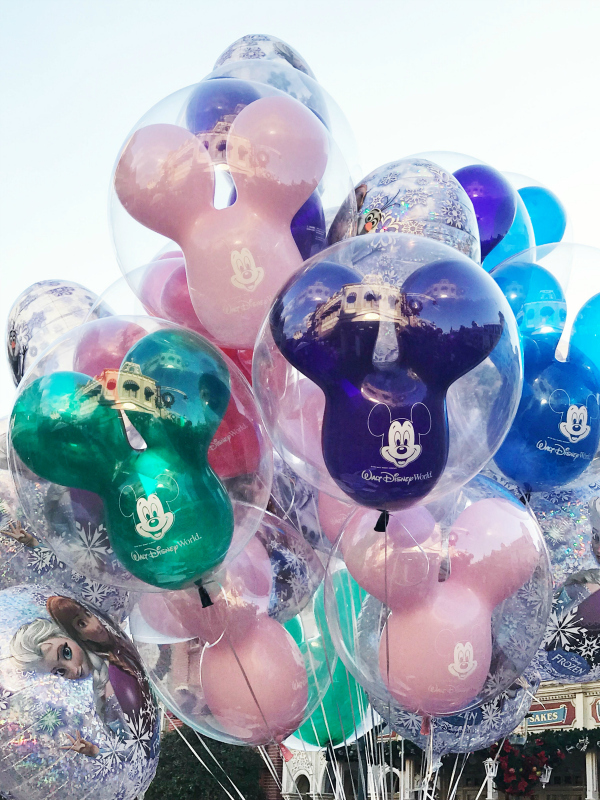 While you are in the park, the cart vendors and quick serve restaurants will give you free water or ice if you ask. We just kept refilling our bottle to stay hydrated. We saved a ton of money because we drank so much water. Like I mentioned already, we packed our own snacks from home to save some money. We filled our backpack with protein packed snacks to sustain our energy while we enjoyed the happiest place on Earth! Also, taking your daughters to BibbiBobbiBoutique isn't in everyone's budget. Its expensive! But you can go to the Castle Couture store in Magic Kingdom and ask for Pixie Dust. They will sprinkle glitter in your hair! It's so fun that Josh and I also participated! This is completely free! Cell Phones Being at Disney will drain your cell phone battery so fast! Fully charge your phone and bring your phone charger with you. There are many different phone charging stations throughout the parks, just ask a cast member for the closest spot. I would also bring a portable charging device. You will need your phone for FastPasses, pictures, and meeting up with your group if you get separated. Also, keep your phone in airplane mode when you can and keep your apps shutdown after you use them. I found that Snapchat is one of the biggest battery drainers. Kiddos My girls are seven and five and they love all things Disney! They really embraced the magic, Mickey, princesses, and the fun atmosphere. We used a double stroller when we went last June (they were six and four then) but we were able to do it this time with no stroller. If you are park hopping, I would say a stroller is a must if your kids are seven or under! But staying in the same park all day allowed us to be able to take our time getting where we needed to because we weren't rushing to the shuttle to get to another park. When we did use a stroller, we rented it at the parks each day. You can get a discount on your stroller rental if you rent for 2+ days so be sure to ask about that when you are renting it the first day. 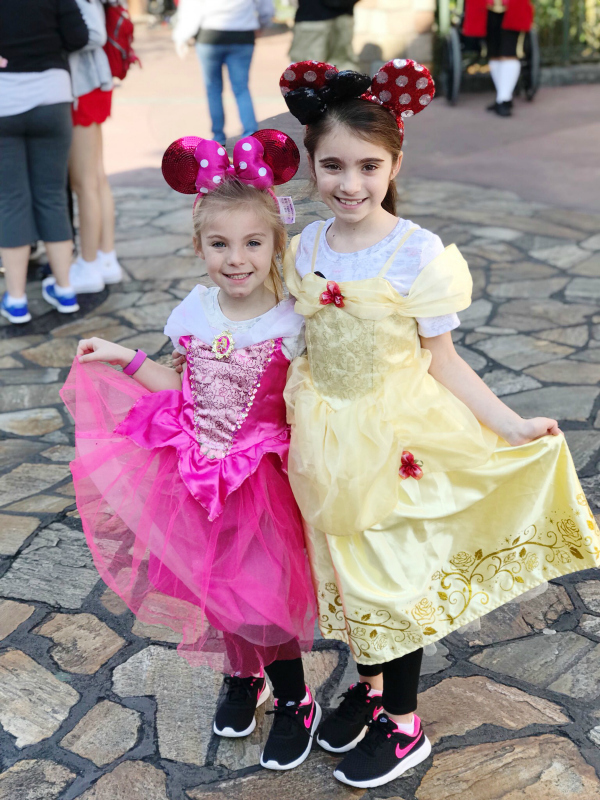 Disney is way more magical with kiddos! Celebrate Josh and I celebrated our eighth wedding anniversary while we were on our Disney trip back in 2016. At our resort at check-in, we let them know that we were celebrating our anniversary and the girls' first time at Disney. They will give you buttons to wear at the park and the cast members are awesome at acknowledging whatever you are celebrating. They really do pay close attention to your buttons so wear them everyday. Josh and I even got a free Mickey pretzel for our anniversary during our last trip! Enjoy My biggest tip is to just enjoy every little moment! This can be hard to do because you will want to see and do everything. Take breaks when you are tired and go get a Dole Whip in Adventure Land. Disney is definitely the happiest place on Earth so just enjoy it all!